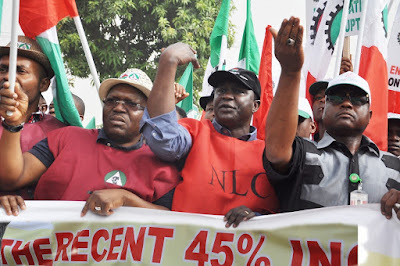 The Nigerian Labour Congress (NLC) is insisting that there is no going back on the already negotiated new minimum wage of N30,000 naira. This follows the position of the Nigerian Governors’ Forum, stated by its Chairman, Governor Abdulaziz Yari of Zamfara state that paying N30,000 naira is not feasible in the face of the current economic situation. The NLC in a statement said “We hereby reiterate our directive to Nigerian workers to vote out any politician or political party that refuses to pay the new national minimum wage of N30,000 naira. The NLC also warned President Muhammad Buhari to be wary of some governors who are bent on portraying him as an anti-worker President for selfish reasons. The union has however vowed to resist any state government that would attempt to frustrate the union’s efforts in putting smiles on the faces of the Nigerian workers. “We call on President Muhammadu Buhari to speedily present to the National Assembly the bill on the National Minimum Wage for appropriate amendment and implementation”.